I WAS listening to the "second" episode of The Unknown Studio podcast as I was writing this post (that's called multi-tasking), because I simply couldn't wait until it was over to tell other Edmontonians about it. This particular episode featured Ward 5 city councillor and self-proclaimed Star Trek nerd Don Iveson, who was recently selected by Avenue magazine as one of their "Top 40 Under 40" Edmontonians working to brighten our city's future. The podcast was produced back in the beginning of July, and centered around discussing "smart growth, transit-oriented development, the Fraser Institute, and hilarious trivia." But this was not my introduction to Adam Rozenhart & Scott C. Bourgeois' topical podcast. I was a late bloomer who didn't plug in until Episode 11 (November 9, 2009), featuring guest speakers Jeff Samsonow and Sally Paulsen of the local blog site TheEdmontonian.com. I was an instant fan of the hosts' sharp wit and relevant questioning, as well as their selection of guests that have, so far, garnered viewpoints from diverse aspects of our city. 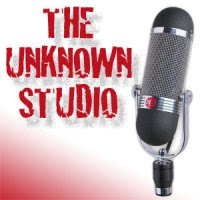 The Unknown Studio, which comes to us "sort of live from an abandoned cabin in the woods...", only popped up in June of '09, but it certainly doesn't show in their on-air discourse, devoid of those awkward moments that poison other podcasts I've heard. But these guys aren't exactly new to this. Rozenhart runs the website OilersNation.com, while Bourgeois is part of the on-air team over at iNews880 radio. They intergrate that experience for this small bi-monthly talk show that is yet to find a sponsor (hint, hint). And they don't shy away from admitting their lack of high tech equipment or their undesirable location, but they've managed to book a steady stream of engrossing guests, including Iveson, playwrights Simon Crowley & Mike Young (Captain Hook vs. the Zombies), 630 CHED's Dan Tencer, Pure Speculation Science Fiction Festival director Brent Jans, and even local entomologist (a.k.a. "bug expert") Peter Daly. Now if they can get "Dancing Dan" they'd be at the top of their game! So now that you've got the lowdown on Edmonton's latest player in the podcast realm, stop reading this here post and go check it out for yourself. Well, what are you waiting for?! Go!! You can also follow The Unknown Studio on Facebook and/or Twitter.